If you follow us on Instagram ( @twopeasinablog ) or Snapchat ( twopeasinablog ), then you know I was in Florida this past weekend visiting the in-laws. The kids had a blast with their cousins and I loved catching up with my sister-in-laws! We all live in different states so it's special when we can all get together. The days were spent driving the golf carts, biking and swimming. The kids spent every possible second in the pool only getting out long enough to eat! It was the perfect relaxing weekend. This Old Navy romper is what I wore to dinner the one night we decided to eat out. With a party of 11 and 5 kids, it's much easier to eat at home. I love the rompers that are out now with long sleeves, perfect for the changing seasons. This print screams Fall to me, so I paired it with booties and a felt floppy hat. If you don't already have a floppy hat, you should get one! They are everywhere and add a great final touch to an outfit. The pattern of this romper also comes in a cami dress, pants, a fit and flare dress, and a skirt. I love the dark grey paired with the creams and tans. What a perfect Fall combo! Do you have a romper perfect for Fall? I love rompers with sleeves too! And this one is perfect!! I have been dying to go to Old Navy and shop I can't wait to see their fall stuff!! I love that print from Old Navy, this Fall. It is like floral camouflage. I want that romper badly. I plan on shopping at Old Navy this week, so I hope to find it. If not, I might get the dress and a top in this fab print. The floppy hat, booties and awesome checkered tote, are perfect with hat romper! I love how you called it floral camo!! You're right it is :) Thanks for your kind words! Great outfit, the romper is really cool! Yes, its a good piece. The fit is perfect and it is good quality. The pattern is what I love most! It's perfect for Fall. Oh my goodness! I saw this last weekend and fell in love! I love how you styled it, gorgeous! Love me some Old Navy! Thanks! Yes I fell in love with the print as soon as I saw it. This romper is so ADORABLE... I didnt see that in my Old Navy but its so cute! I have a hat like yours but got mine from Kohls. Love it for fall! Thanks! The felt floppy hat is so fun for Fall! I have seen that romper floating around and I loveee it!! Sadly it's been sold out every time I've checked! Too cute! Oh, bummer! I hate that! Good luck searching for it. I just love Old Navy so much. 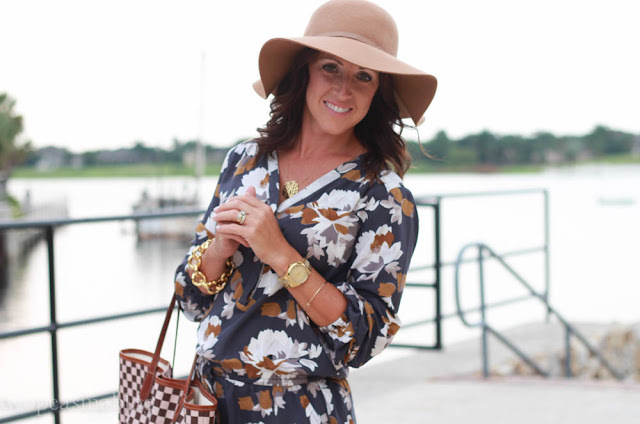 I've recently been craving the addition of a fall romper to my wardrobe; this one just might be the winner! SO cute! Super cute romper, goes great with the boots! So perfect for summer and fall! I want this romper so badly! I love it on you!! Love this romper, and I really like how you wore a checkered bag with it for a fun play of patterns! LOVE this romper! Saw a sneak peek of it over the summer and was patiently waiting until it arrived!! Looks great on you! What a great romper...the colors are perfect and it looks so FAB on you! I'm swooning over your tan...making me wish I still had one! This romper is so perfect for early Fall. It looks cool enough for warm weather, but the print and sleeves make it Fall appropriate. I love, love, love it! Fabulous styling! Love the print romper!!! Autumn vibe!